Hey everyone, just a friendly letter to say the website is up with 24 Marilyn Monroe hoodies right now. Every week I plan to add some more that I find from blogs around the internet. Its a tough process because a lot of Marilyn Monroe hoodies and sweaters only are made for a few years before they are discontinued. A discontinued hoodie can only be found on sites like ebay or a thrift store. If you find a Marilyn Monroe hoodie you love please post it in a comment. I hope this website can be a place to find the lost Marilyn Monroe sweaters from the 60s and 70s. Many of the sweatshirts from that time period never make it online. Rue 21 exclusive Marilyn Monroe hoodie. One thing I want to let you know about is the Rue 21 Marilyn Monroe hoodie which is absolutely gorgeous. It comes in a few colors and because its summer they are on sale right now for $12. This is an absolute steal considering it went for $50 to $60 last winter. Rue 21 is the only place that carries this. I have not seen it anywhere else online, so I have a feeling it might be discontinued next year. Hopefully it won’t be sold out before you see this. The colors they use are fresh air compared to the majority of hoodies that tend to be more black and white. It also comes in a nice orange and cheetah pattern black. 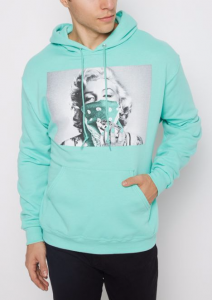 The way they color Marilyn’s bandanna in the hoodie is creative and it is definitely something I will be wearing out to show my Marilyn Monroe hoodie pride. They only have a handful of Marilyn Monroe hoodies, but they have some non hoodie clothing with gorgeous Marilyn Monroe designs. Definitely worth checking out before it is all discontinued and the only place to grab it is a thrift shop. Some other things we have planned for the website are videos of thrift store shopping for Marilyn Monroe hoodies. I think this could be fun to see my reaction because alot of my friends say I get too excited when I find a new Marilyn Monroe sweater. I’d also like to get some people to do guest posts. If you have your own hoodie collection please feel free to leave a comment and we could exchange posts. Don’t forget Marilyn Monroe’s birthday is comming up on June 1st! Super excited for this, I think I will wear like 5 Marilyn Monroe hoodies that day. Don’t forget to celebrate and spend some time thinking about her ! She will have been 91 years old:). There are some special bithday themed Marilyn Monroe hoodies too. I will probably end up doing a special post on June 1st just to celebrate those.